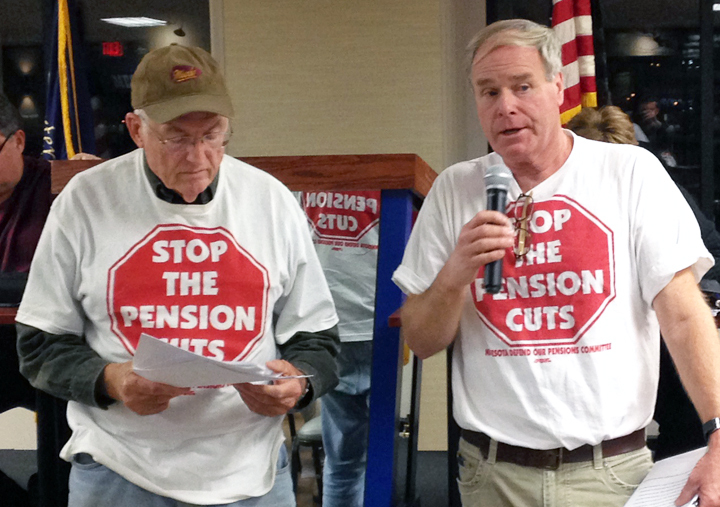 Jeff Brooks (R) and Bob McNattin, both retired members of Teamsters Local 120, have been raising awareness about a looming congressional attack on defined-benefit pensions. They fended off drastic cuts to their pension benefits earlier this year, but Teamsters retirees aren’t resting on their laurels. Instead, they are organizing to stop a new bill gaining momentum in Congress that would weaken, rather than strengthen, the funding of defined-benefit pension plans. It’s known in Washington as the “composite bill,” and retirees like Bob McNattin fear it will sneak through Congress during the lame-duck session. “The composite bill is, I think, intended to be the pathway to get employers out from under any pension obligations to their employees whatsoever,” he said. A retired truck driver and former member of Teamsters Local 120, McNattin is an officer in the organization Save Our Pensions-MN. The group formed in response to the Central States Pension Fund’s plan to slash benefits by as much as 65 percent for tens of thousands of Teamsters retirees. The Treasury Department rejected Central States’ proposal in May, but the fund, which is backed by the federal Pension Benefit Guaranty Corporation, remains in financial trouble. Now, Save Our Pensions-MN is lobbying Congress to find a permanent fix that will secure the pension’s financial viability – and it’s not the composite bill, retirees say. “It’s a betrayal of trust,” he said. Save Our Pensions and other retiree groups don’t have a lot of time to muster opposition to the composite bill, which, according to the Pension Rights Center, could be following the same path as the Multiemployer Pension Reform Act of 2014, which allowed Central States to demand steep cuts from current retirees. The MPRA never received a stand-alone vote, but was attached as an amendment to must-pass, year-end legislation keeping the government open. “These bills would never pass on their merits because they’re so flawed,” McNattin said. 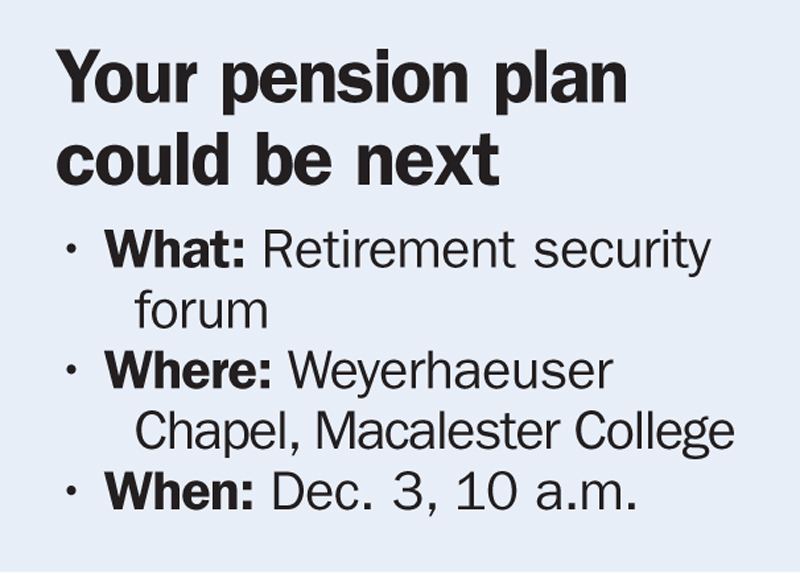 To call attention to the composite bill and discuss other threats to retirement security, Save Our Pensions-MN will hold a forum at the Weyerhaeuser Memorial Chapel at Macalester College Dec. 3. It’s free and open to the public. « Jeff Couillard: What if retail workers took a two-week break – starting on Black Friday?